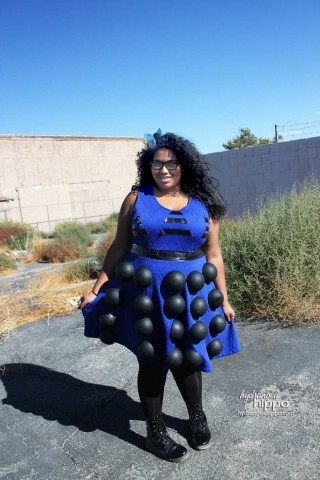 DIY Doctor Who Dalek Costume « Adafruit Industries – Makers, hackers, artists, designers and engineers! Transforming yourself into a Dalek doesn’t have to be a complicated process. You can build a suitable costume inspired by the Doctor Who villain by starting with a basic dress. Jennifer Priest of Hydrangea Hippo made such a costume for her daughter to wear for Halloween, and it all started with a $15 dress from Ross. Other materials included Smoothfoam’s half styrofoam balls, black duct tape, velcro, a whisk and plunger, and spray paint.